Herbicide injury caused from metribuzin, a photosystem II (PS II) inhibitor. Older leaf interveinal and marginal chlorosis. Older leaf necrosis followed by dieback. Mottled or interveinal chlorosis develops after necrotic tissues have dropped. Necrosis of young, tender stems exposed to the spray. Metribuzin drift on Knockout rose five days after treatment. Metribuzin on grape five days after treatment. 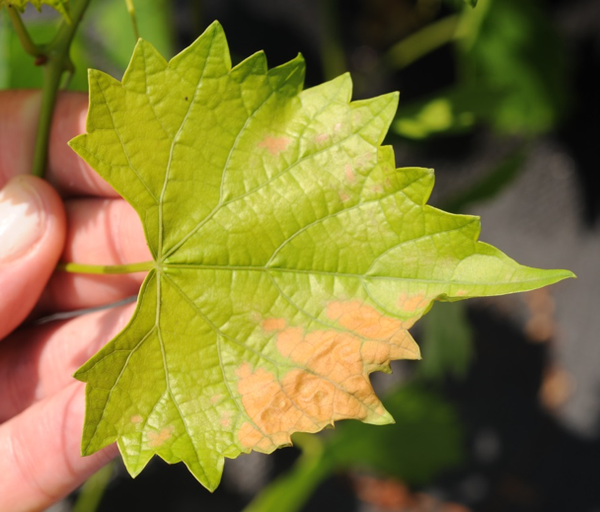 Grape foliage, 14 days after treatment. 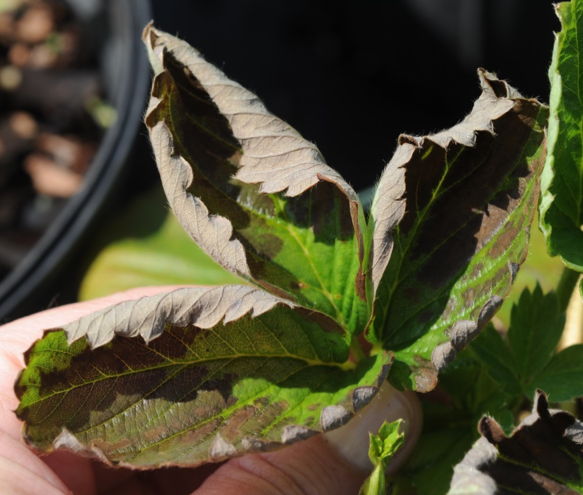 Metribuzin drift on peach foliage five days after treatment. Metribuzin on strawberry five days after treatment. 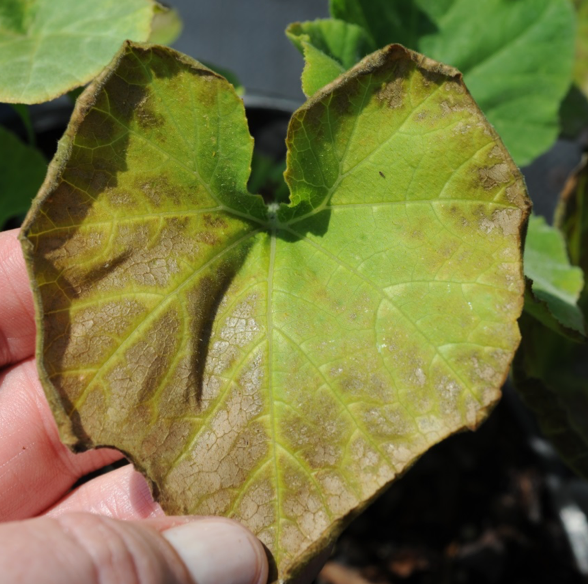 Metribuzin on acorn squash five days after treatment. Foliar or root assimilated and translocated up the plant. 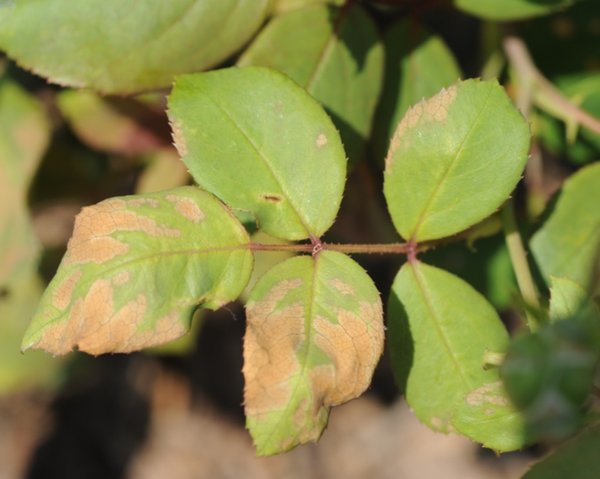 PS II inhibitor injury symptoms from as-triazines first appear as interveinal chlorosis on older leaves within about seven days of application. Sensitive plants receiving high doses will develop necrotic stems. 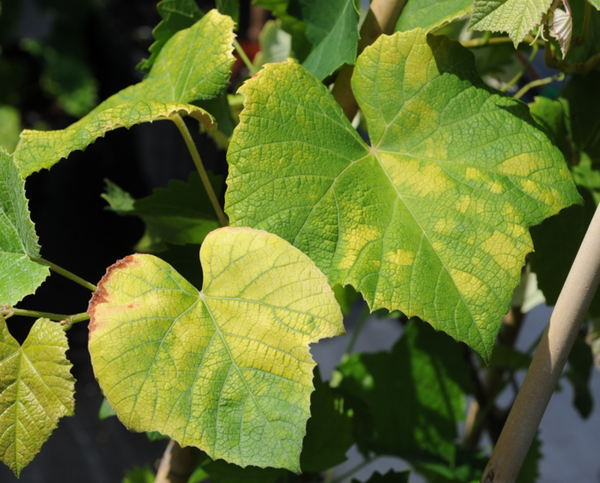 New leaves forming after exposure may develop interveinal or mottled chlorosis. Urea and other PS II inhibitors such as s-triazines. Fast acting, contact herbicides such as paraquat. Chlorosis of growing points caused by ALS inhibitors such as halosulfuron – differentiated by general chlorosis of new growth rather than interveinal chlorosis caused by PS II inhibitors. Mottled chlorosis between leaf veins may resemble damage from foliar nematodes or micronutrient deficiencies. Ozone may cause interveinal chlorosis, bleaching, and necrosis.